KAIST medical scientists have presented a heterogeneity of immune cell exhaustion in the cancer environment, providing evidence and rationale for designing optimal strategies for immune checkpoint inhibitors in liver cancer patients. They succeeded in distinguishing the hepatocellular carcinoma group from the exhausted tumor infiltrating immune cell composition of liver cancer patients. The study, conducted in collaboration with Asan Medical Center, confirmed the applicability for liver cancer patients, providing a new path for personalized precision medicine as well as a new model for translational research. Our immune system is able to destroy cancerous cells in our body, however sometimes cancer cells can adapt and mutate, effectively hiding from our immune system. One of the mechanisms that has evolved to prevent eradication by the immune system is to functionally silence effector T cells, termed T-cell exhaustion, that is mainly mediated by immune checkpoint molecules such as PD-1, TIM-3, and LAG-3. Recent breakthroughs and encouraging clinical results with various immune checkpoint inhibitors (ICIs), such as anti-PD-1 monoclonal antibodies (mAbs) and anti-CTLA-4 mAbs, have demonstrated tremendous potential to cure cancers through the immune activation of exhausted T cells. Immune checkpoint inhibitors showed significant clinical benefits for several types of cancers, leading to their wide application in clinical practice. Anti-PD1 blocking antibodies are one of the most representative agents in this class of drug. However, it has been challenging to precisely understand the biological and clinical significance of T-cell exhaustion in cancer. A KAIST research team led by Professor Su-Hyung Park reported the heterogeneity of T-cell exhaustion in hepatocellular carcinoma (HCC) and its potential clinical implications in Gastroenterology on December 4. The team revealed that heterogeneous T-cell exhaustion status is determined by the differential PD-1 expression levels in CD8+ T cells in liver cancer patients. 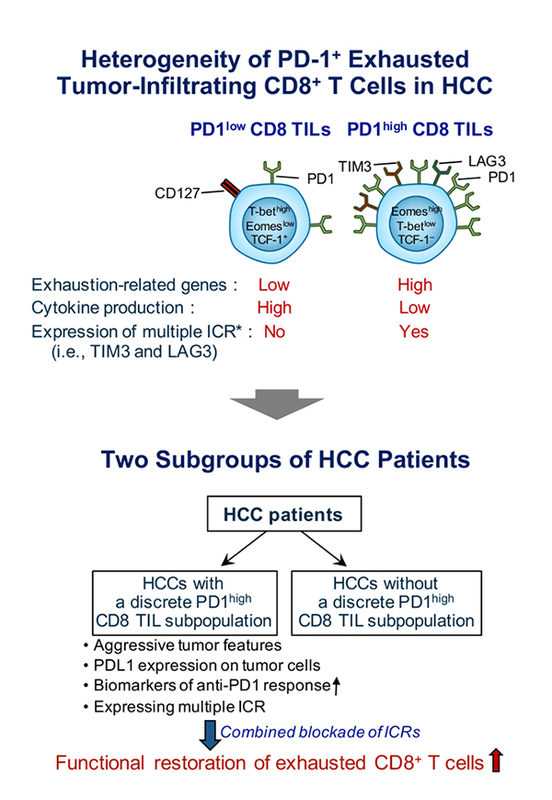 The authors found that tumor-infiltrating CD8+ T cells with high PD-1 expression from liver cancer patients are functionally impaired and co-express other immune checkpoint receptors such as TIM-3 and/or LAG3, compared to those with low PD-1 expression. Moreover, based on these results, the authors suggested that liver cancer patients can be classified into two distinct subgroups. Patients having high PD-1 expression levels in the tumor microenvironment showed more aggressive tumor features and biomarkers predicting a favorable response to anti-PD1 therapy. The research team also demonstrated that only liver cancer patients having high PD-1 expression are susceptible to combined immune checkpoint blockade-based therapies. Prof. Park said, “The new classification of liver cancer patients identified by this study can be utilized as a biomarker to predict the response of current cancer immunotherapy targeting the PD-1 pathway.” He also said they will continue to conduct research on T-cell exhaustion and activation in various types of cancer, which could lead to a better understanding of T-cell response against cancer, thereby providing evidence for future cancer immunotherapy to achieve the ultimate goal to prolong the survival of cancer patients.